To ensure the comfort of delegates and to avoid time lost in transportation between the 2010 CIML meeting venue and delegates' hotels, it has been decided to hold all the meetings in a single location in Orlando, where all the delegates will also be accommodated. 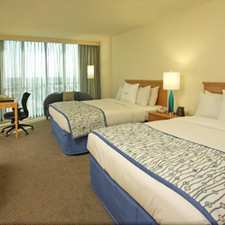 The DoubleTree Orlando has been selected; located in the heart of Orlando, Florida, it is just steps from the entrance to Universal Orlando on International Drive and only 12 miles (19 km) from Orlando Airport. 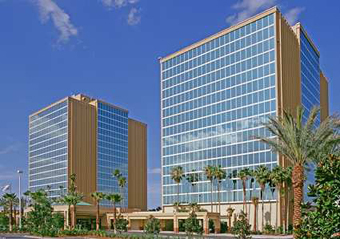 Housed in two grand towers with sweeping views of Orlando's world-famous theme parks, the hotel features 742 newly renovated guestrooms, including 19 suites. Check-in time is 12:00 and check-out time is 10:00.
quoting the Group Code Reference "NIS" when booking. Please note to guarantee this special room rate, bookings must be made prior to 21 August 2010. All individual guests will be responsible for booking their own rooms, and for settling their own accounts on the day of departure by cash or credit card. Personal cheques will not be accepted unless otherwise approved in advance by the Hotel Financial Controller. On arrival a pre-authorization will be taken on the client's credit card.